In an author's note in The Kingmaker's Daughter (about Anne), Phillipa Gregory writes "I don't subscribe to the Shakespearean parody that has blackened his [Richard III] reputation for centuries. But also I don't acquit him of usurpation." Shakespeare's play was written a little more than 100 years after Richard's death on the battlefield (the last English king to die in this way). This was not ancient history of some far away time and place, this was the recent history of the very place where the play premiered. Perhaps it's not so surprising that Shakespeare painted Richard as the villain, considering he lived in an England ruled by the granddaughter of the man who ended Richard's life and his reign. I imagine Queen Elizabeth might have enjoyed watching her grandfather King Henry VII kill the evil man in the end and win back the crown that would eventually be passed down to her. But I digress, this is a theater blog not a history blog! In Shakespeare's version of the story, Richard III is a power-hunger man who will stop at nothing to become King of England. When his brother King Edward IV dies, he is named Lord Protector of Edward's heir. But instead of crowning young Edward as King, Richard imprisons him and his brother Richard in the Tower of London (part of the reason the history of England is so confusing is that everyone has the same half a dozen names!). Richard decides that he should become King of England himself, so he has the princes killed (allegedly, their disappearance from the Tower remains a mystery, and in fact what is believed to be their skeletons were not found until 80 years after Shakespeare's play was written, but I digress again!). Shakespeare also has Richard killing his brother George (who was actually executed for treason by King Edward), forcibly marrying Anne, and hoping to marry his niece Elizabeth (ew), both marriages to win the money and support of the women's families and followers. The play shows Richard progressing in his evilness until he wins his prize, only to finally lose it, exploring themes of greed, ambition, power, and conscience (or lack thereof). A huge and capable (and sadly, non-diverse) cast of over 20 bring this story to life. 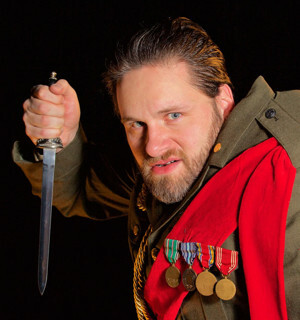 As the titular character, Lucas Gerstner makes Richard an amusing yet terrifying villain, with frequent monologues and asides to the audience bringing us inside his head. Other highlights include Tina Frederickson as the queenly Elizabeth, McKinnley Aitchison as the grieving and put-upon Anne, Meri Golden as the deposed Queen Margaret hovering just on the edges, seemingly crazy but speaking truths, and the two young women (Erin Granger and Nykeigh Larson) playing the princes a la Mary Martin as Peter Pan. The program notes that this production takes place in the early 20th Century, rather than the late 15th Century, but I don't see where that manifests other than the fact that the men are wearing suits instead of tights. Nothing in the sparse and efficient set points to a time period, and this story is a little too sordid for the monarchy of the 20th Century, when the royal scandals had been reduced to relatively tame things like wanting to marry a divorcee. No matter, it doesn't get in the way of the storytelling. Theatre in the Round's production of Shakespeare's epic history play Richard III is well done and entertaining, even if I do still prefer the more complex and woman-friendly world that Philippa Gregory created. 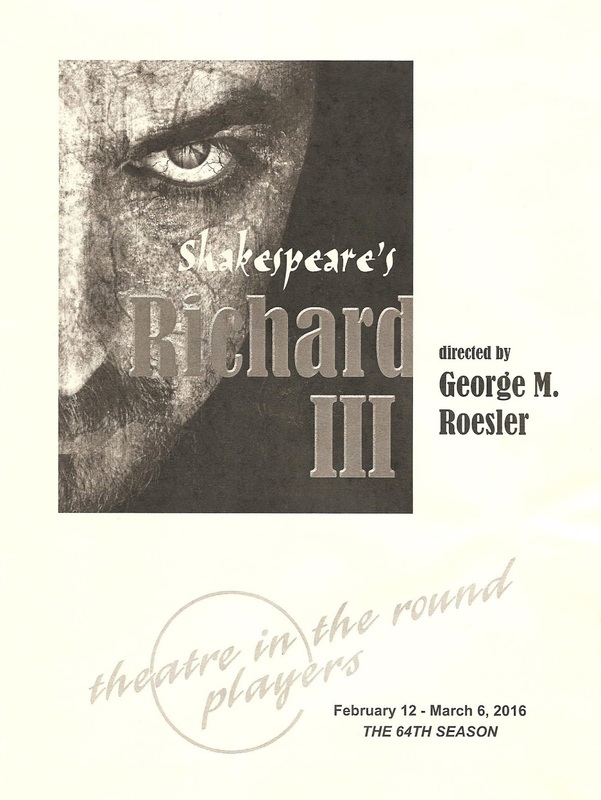 Richard III continues through March 6.